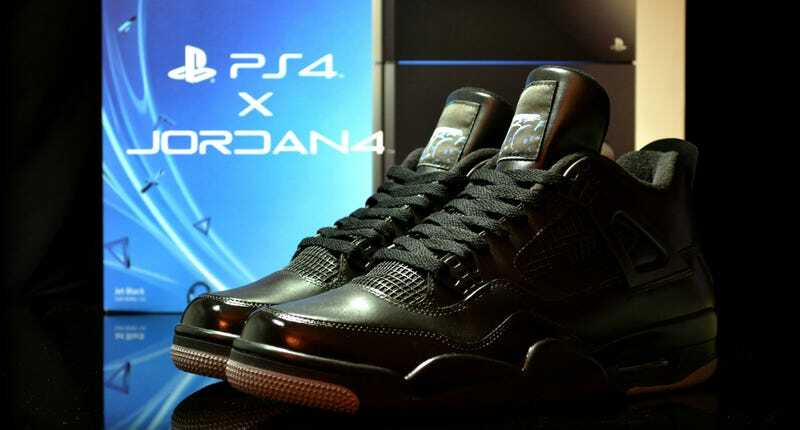 Behold, a pair of custom PS4-themed Jordans. The simple colour scheme makes them look, from the front, like something you'd really want to own. But then you see the back (and the price). Yes, that's a HDMI port. It doesn't do anything, it's just there. Thankfully, you can take the cord out, leaving just the ports. The work of Jonny Barry, he's actually made ten pairs of these, which he'll be selling for (those not familiar with custom sneakers may want to avert their eyes) $950.